PACE Act allows states to define the ACA Group Mandate – Does it impact your organization? Group health insurance for international staff overseas just got a bit more complicated. Already international organizations with staff overseas were trying hard to comply with the ACA group mandate which requires large groups to provide insurance for their workers. But now it appears (Due to the PACE Act – see below) that the states define the ACA group mandate, or at least aspects of it, by stating whether 100FTE (full-time employees) or 50FTE define whether a group is large or small. The definition of a small employer for purposes of MLR, risk corridors, and risk adjustment will follow the State definition. This appears to be the case through 2017 or until we see another ruling. Until then, states define the ACA group mandate and the ACA group mandate size will be whatever the state says. Either way, groups with staff overseas do not/cannot count those individuals residing overseas towards their group size in order to qualify for insurance. And some carriers have already begun to drop groups under 100 staff due to uneven state regulations. Good Neighbor Insurance has always looked after our smaller groups equally to our large ones. We are something of a champion for smaller non-profit organizations, mid-sized mission agencies and faith-based groups with a presence overseas, and the large numbers of social good businesses and social entrepreneurs overseas that simply don’t have the staff to gain the attention of many health insurance carriers, regardless of how states define the ACA group mandate. See what Cigna, one of our carriers has said here. The Small Business Administration discusses businesses with over 50FTEs. See what BlueCross has said here. See what Aetna has said regarding groups, and regarding individuals. See what United Healthcare has said here. This Amendment to the Affordable Care Act has big implications for employers with 51-100 workers. Small Business Redefined: On October 7, 2015, President Obama signed into law the Protecting Affordable Coverage for Employees (PACE) Act. 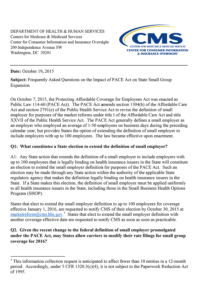 The PACE Act amends the definition of “small employer” in the Affordable Care Act (ACA) so that it would continue to apply to employers with one to 50 employees, rather than changing to one to 100 employees as of 2016 as provided in the original ACA; however, the new legislation also allows states to opt for the one-to-100 employee definition of small employer if they choose. On October 19, 2015, the Centers for Medicare and Medicaid Services (CMS) released a series of frequently asked questions explaining how it will implement the PACE Act. States may elect to extend the definition of small employer to cover employers with up to 100 employees by any means that is legally binding under state law, as long as the definition applies to all insurers, including those in the Small Business Health Options Program (SHOP) program. What constitutes a State election to extend the definition of small employer? for purposes of the PACE Act. Such an election may be made through any State action within the authority of the applicable State regulatory agency that makes the definition legally binding on health insurance issuers in the State. If a State makes this election, the definition of small employer must be applied uniformly to all health insurance issuers in the State, including those in the Small Business Health Options Program (SHOP).